What a fantastic sketch of whatever that thing is! The shadows really make it pop out. Now I will have to go try some rambutan! Wonderful painting! What a strange and interesting plant!! Wonderful drawing. both are really lovely!!! Love your everyday in may series!!! Wow, I haven't visited for awhile. So many beautiful sketches to look at. Thanks for the link to rambutan. I never heard of them before. These look amazing although I don't know if I would eat them. They look a bit too hairy for my taste. Do you eat them? Good work, Debra. I will be looking forward to seeing all of your May paintings. Gorgeous! I like your other drawing too, but the composition in this current one is more interesting. 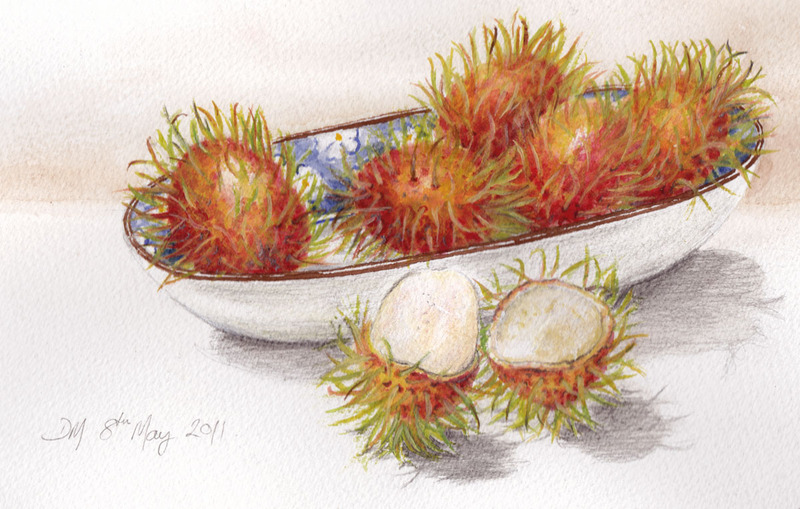 The blue interior of the bowl really sets off the color of the rambutan. I remember your last drawing of rambutan ^^ And I still think they are equally as good if not BETTER! The new version is a lot softer... I must admit am never a great fan of rambutans, but I sure miss the taste sometimes. This is fantastic! What a crazy thing this rambutan is! Odd little things but very well done!